the Edna & Arroyo Grande Valley Wine Regions define Amore! You don’t need to travel to Europe to explore a romantic, renowned wine region reminiscent of Tuscany, Italy – it’s available along the California Highway 1 Discovery Route. Take a road trip to Edna Valley and Arroyo Grande Valley wine regions where green vineyards and golden rolling hills cover the landscape. Often referred to as SLO Wine, you can fill your bucket list with boutique, off-the-beaten-path wineries offering excursions, history, culture and romance among more than 2,000 acres of vineyards and 27 wine tasting rooms. Just five miles from the Pacific Ocean, Edna Valley offers constant refreshing breezes and warm sunshine that create the longest growing season in California, ideal for Chardonnay and Pinot Noir. Ocean breezes combine with sun and rich soil to grow world-class grapes in this American Viticultural Area (AVA) located in San Luis Obispo County. Ocean views at one end, rustic California hills at the other, and the quaintest village right in the middle to shop, eat and play. Taste award-winning wines at every stop along SLO Wine Country’s southernmost wine trail, and you’ll be charmed every step of the way. offers half and full day wine tasting tours where riders travel through the rolling farms and ranch land of Edna Valley, stopping by award-winning wineries. The tours include a complimentary wine tasting along with a gourmet picnic lunch. This is a quintessential California Central Coast wine country bicycle trip for cyclists of differing abilities and interests. 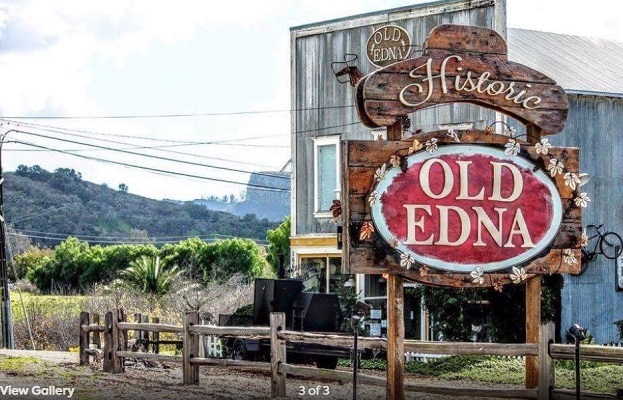 Old Edna Townsite Located at the center of the Edna Valley wine region, the one-of-a-kind, two-acre Old Edna is a great historic village that serves as a hub for information about the region. The Townsite is home to Wine Tasting by Sextant Wines, the Gourmet Deli, and two fully restored vacation rentals with vintage touches. Don’t miss the Bohemian Gypsy Caravan, Madam Mayor’s Sippin’ Cellar, and the famous Blue Belly Barn. Have fun while exploring, grab a bite to eat, do a little wine tasting and unwind after a long day’s travel. Lopez Lake Recreation Area Located just ten miles east of Arroyo Grande, Lopez Lake Recreation Area is one of the best hiking spots around. 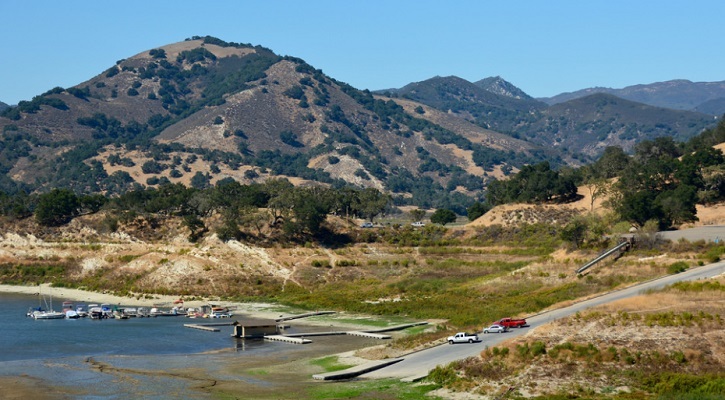 The recreation area stretches over 22 miles of shoreline offering fishing, boating, picnicking, hiking and equestrian trails, mountain biking, zip lining, bird watching, picnicking and so much more. The best part is there’s never a bad time to visit here – the weather is beautiful, making it the perfect year-round destination. Windmill Farms Have you ever dreamed of going to your local weekend farmers’ market every day? Wish granted! Windmill Farms is a daily market that boasts the freshest produce, artisanal cheeses and bread, handmade pottery and much, much more. Stroll through the garden area and look around at succulent roses and sculptures, and when you’re ready, step inside the barn (yes, all this goodness is inside the cutest rustic barn!) to be amazed by their selection of fruits, vegetables, and gourmet delights. Historic Huasna Townsite Drive/Ride If you like to see large ranches framed by miles of rolling hills and gorgeous trees, then don’t miss the Historic Huasna Townsite. The Huasna Valley is just 20 minutes from Arroyo Grande and it’s known for growing succulent fruit, beautiful flowers and lots of veggies. The area is best known for its biking route along Huasna Townsite Road. Be prepared to sweat a bit, coasting down the hills is a breeze but pedaling up them can be a workout. You’ll be rewarded with amazing views, so the payoff is totally worth it. Swinging Bridge The Swinging Bridge is an interesting historic site in Arroyo Grande. The only one of its kind in California, the bridge is 171 feet long and swings 40 feet above the Arroyo Grande Creek. First built in 1875, the original bridge did not have sides to hold on to! They were added in 1902. In 1911 the bridge was given to the City of Arroyo Grande and is open for the public to enjoy. Mustang Waterpark Enjoy some good old family fun at Mustang Waterpark, conveniently located at Lopez Lake Recreation Area just 10 miles east of Arroyo Grande. The park has water slides for days, and for all ages to enjoy. And don’t miss The Stampede, Mustang’s coolest attraction! Plummet 38 feet down one side of a giant water filled half-pipe in an inner tube, and then speed right back up 38 feet on the other side! You can ride solo for this one, but you might wanna grab a buddy to hold on to, it’s a wild ride! Clark Center for the Performing Arts From stand-up to Shakespearean classics like The Taming of the Shrew, to a neo-traditional Hawaiian band, you won’t want to miss out on what the Clark Center has in store. The Center was built in the late 1900s when Cliff Clark, a local resident, was sick and tired of seeing Arroyo’s finest talent having to perform in the high school gym. Be sure to keep an eye on their website for upcoming shows and ticket prices! It’s located in the city of Arroyo Grande, a quick 10-minute drive from the valley.